Coleshill House (SN6 7PT) was the hush-hush headquarters of Churchill’s Secret Army, or the Auxiliers. Discover the detailed history of their training and visit some of the remaining Second World War features around the village, including the Guard House and the original prototype underground training bunker or Operational Base (OB). Plus, check out the newly built and refurbished replica “funk hole” and see the new display of artifacts including a rare copy of a Stand-Down letter. Suitability: Children welcome (12+) / Assistance dogs welcome. Park & meet: at the Coleshill Estate Office car park. What to bring & wear: Please wear appropriate clothing for weather conditions. Flat sturdy shoes/boots/wellingtons advisable. Accessibility: A fairly long, flat walk through the village, woods & fields. 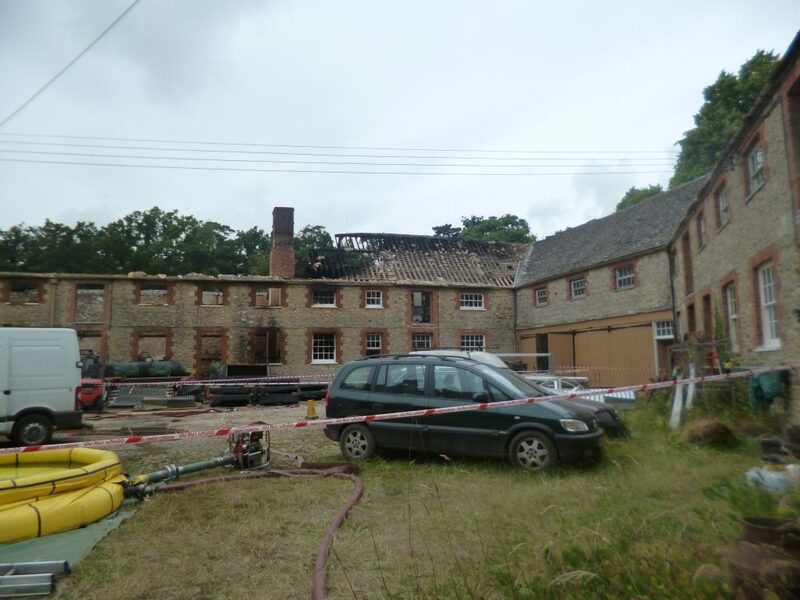 This morning our Coleshill researcher Bill Ashby visited the site and spoke to the fire crew and National Trust site management. Luckily the fire was held back and did not spread into the end house. By entering the Commandants Offices and making a hole in the ceiling of the Typists room the Fire service were able to pour water on the fire without causing any other damage. 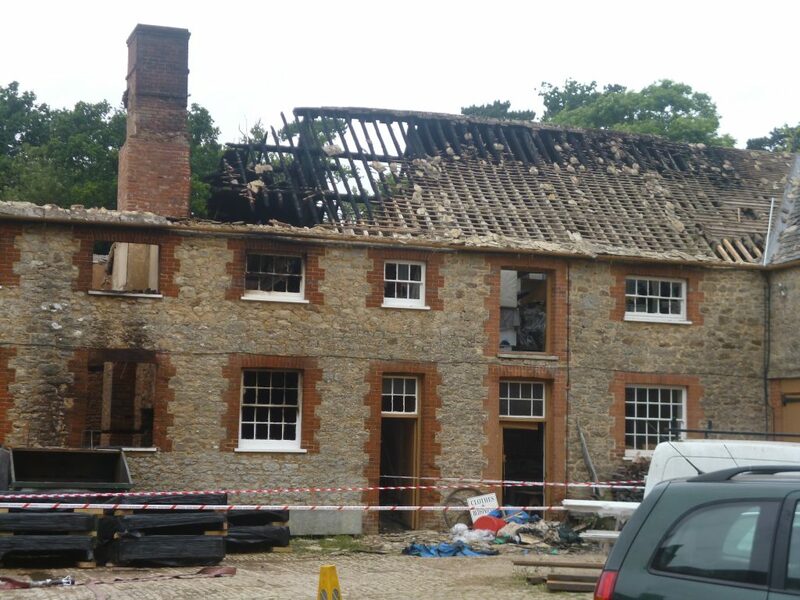 This meant the fire was kept to the section we know as the “Accommodation Block”. The cause of the fire is still being examined. 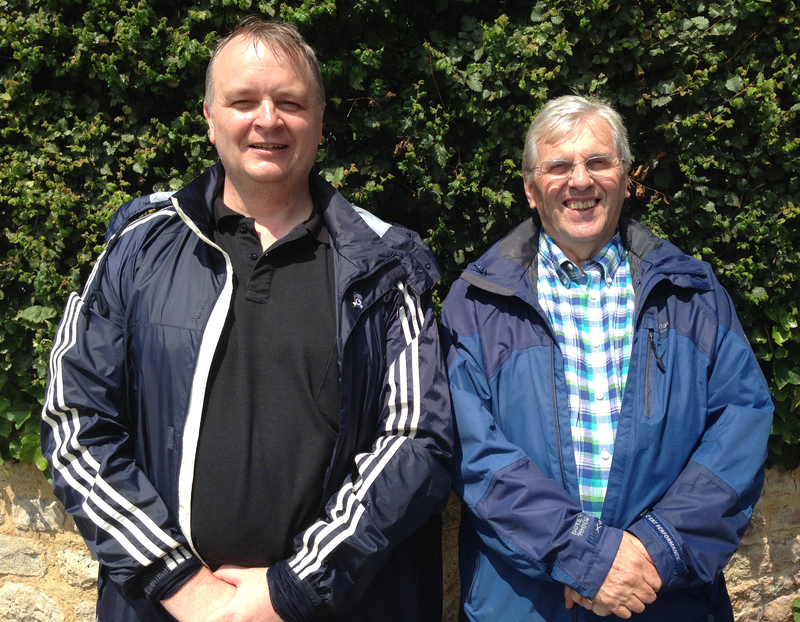 Today we welcomed Ian Edwards (left) to GHQ Coleshill. 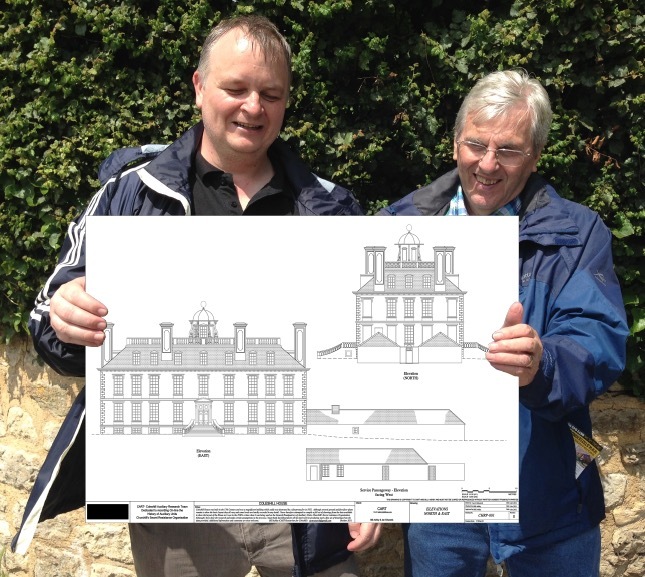 Ian has been working on CAD drawings of Coleshill House and the important Stable Block for the last few years under the guidance of Bill Ashby (right) our Coleshill researcher. The Stable Block was used by admin staff of the Auxiliary Units. You can see more about Ian’s work and the Coleshill House Reborn Project here. As the sun sets over Coleshill and the re-enactors pack up their tents we look back at the past 48 hours and say well done to everyone who took part. 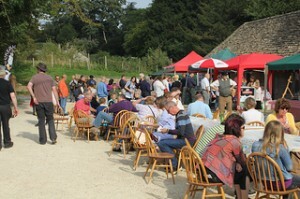 The weekend follows months of planning by the National Trust at Coleshill and was a vast improvement on the previous event in 2010. There were many catering retailers this year and the food options were very tasty. Entertainment was provided by the Warneford Big Band and there was plenty to do for children and families from face painting to code breaking. On Saturday the new replica Operational Base was opened by Coleshill trained Auxilier Bob Millard and after a brilliant speech he cut the ribbon with his Fairbairn Sykes dagger before taking the time to talk to young and old about his training and service. 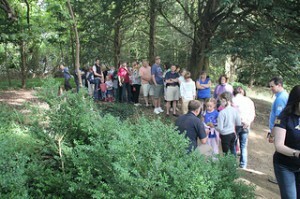 Crowds then queued for hours to have a sneak peak inside the unfinished building. CART researchers wandered around the vast estate answering questions and helping people find the key parts of the site. On both days there were three talks given. 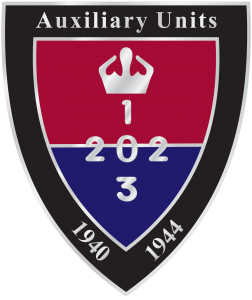 Bill King spoke about how the Auxiliers were formed. Karen Fielder spoke about the architectural masterpiece that was Coleshill House and Chris Pratt from the British Resistance Museum at Parham educated listeners on the three elements to the British Resistance Movement. The talks were full on both days. 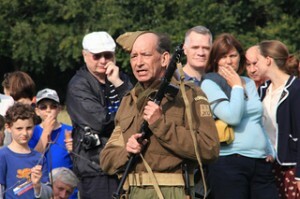 Auxiliary Re-Enactors brought the sites wartime use to life with weapons displays, loud bangs and hands on practical education of weapons and explosives used. Tony Salter brought his excellent mobile Aux display and fired up the children’s imagination. 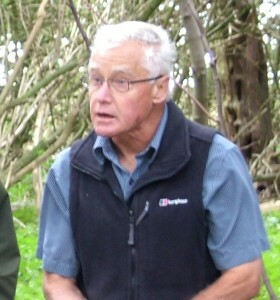 Roger Green provided guided tours and more than comfortably filled the boots of the late warden Keith Blaxhall. There were many vintage vehicles on display with the Austin 7 club and the Military Vehicle Trust (MVT) present. 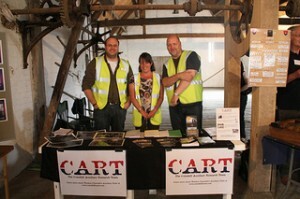 On Sunday CART researchers set up a small display in the Granary and answered many questions from the public. Impressionist, playwright and comedian Rory Bremner even popped in and picked up a CART flyer. Later he posted on Twitter. Thanks to all who took part and all who attended and special thanks to Keith Blaxhall who kept the Aux fire burning at Coleshill for over 30 years. It is with great sadness that we report the death of Keith Blaxhall. Keith was the Head Warden at Coleshill (National Trust) for over 30 years and was incredibly influential in the creation of CART and was a founding member. He died peacefully in his sleep on Saturday. Keith features on our Weapons DVD and was a real ambassador for keeping the memory of the Auxiliary Units alive. Keith was qualified as a Building and Land Surveyor and worked for an architect, a national contractor and in local government. 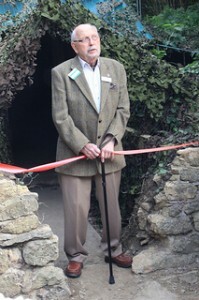 Keith retired in May 2011 but for more than 30 years Keith was the Head Warden for The National Trust in West Oxfordshire and managed country estates, archaeological sites and woodlands covering in all approx 10,500 acres including Coleshill. 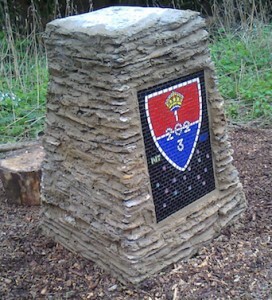 He was the secretary of The Ridgeway Military and Aviation Research Group with a museum at RAF Welford near Newbury. Keith was also a member of The Airfield Research Group and The Mosquito Aircraft Museum and contributed parts to The Assault Glider Project at RAF Shawbury. He leaves a wife and family and a huge void in the hearts of local historians. 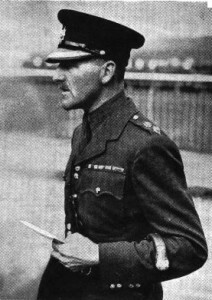 Today we have published a few pages on Major Malcolm Ernest Hancock MC. 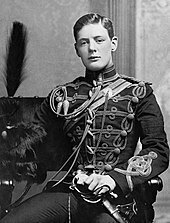 Major Hancock protected Churchill and other VIP’s at Chequers before becoming a senior staff officer at Coleshill.